Let's discuss the influents and the effluents. That's right, you high school graduates -- the poop flows in­ -- that's the influent. What empties five miles out into the Santa Monica Bay, what is ground up, dehydrated and sifted for fertilizer, and what you personally contribute if you live in Los Angeles, is the effluent. And it's all managed through chemistry and engineering at the Hyperion Treatment Plant. Headworks -- where the big stuff is captured: I don't have a picture of this, but I like saying it. 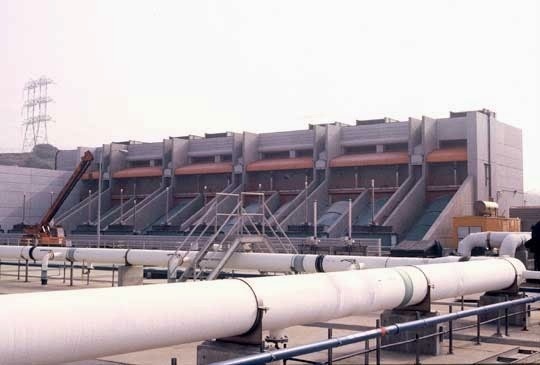 These are the largest wastewater-related Archimedes screw pumps in the world. This is the pump at work. Archimedes invented this circa 290 B.C. It didn't stink at Hyperion. At one point we even smelled barbecue. Trivia: *The original one word was "plastic" and the quote is from a 1967 movie. Post below if you know the name of the movie. More kind-of-icky-makes-you-wonder trivia: The Hyperion Treatment Plant was used as a set for a key scene in the 1973 film Soylent Green. It's where they "pretended" the bland yet nutritious "Soylent Green" wafers were manufactured. STEM Trivia: There are few women working here, but the few who do work in the marine biology and chem labs.